Together with Fabian Frielitz, I was awarded the Hamburg Teaching Award 2017 (Hamburger Lehrpreis 2017) for our team teaching efforts in the context of the course “Academic research and writing” (ARAW), which forms part of the degree programme “Foreign Trade / International Management (B.Sc. )” at HAW Hamburg – Hamburg University of Applied Sciences. First and foremost, I would like to thank my students for the nomination: I feel deeply honoured by your sympathy. Furthermore, I would like to express my gratitude to my two academic tutors Dawid Szmigielski and Serhat Akkaya as well as to our librarian Detlev Dannenberg for constantly supporting the course. You would have deserved the price as much as we do. Last but not least, I would like to thank Rita Werner and Stephan Beier for their ongoing support of the ARAW project. The award highlights a temporary point of culmination of a design-based research project, which started with the development of a completely new course design in 2012 and continued with the introduction of a blended learning scenario in 2014, the competency-based restructuring in 2014/15, the implementation of a dedicated website with video tutorials and the publication of a corresponding textbook and an e-book in 2016. And yet, the ARAW story goes on. The ARAW team is preparing the next big step, which will be announced soon: Stay tuned! 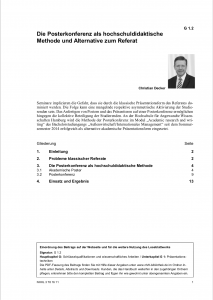 Die Posterkonferenz als hochschuldidaktische Methode und Alternative zum Referat. Neues Handbuch Hochschullehre. Berlin: DUZ, G 1.2.